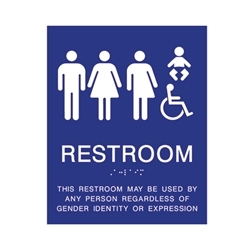 Similar to our ADA-1230 Sign .But with added gender neutral and baby pictograms. Our made-in-America ADA Compliant Restroom signs are high-quality and professionally manufactured. Our ADA restroom signs meet ADA sign regulations and will pass official Americans With Disabilities Act compliance inspections.